Everyone knows that summer is my favorite season of them all. Warm rays of sunshine beaming on your back, less clothing (I mean who really likes to wear tights? They are a modern day torture device), swimming in the ocean, and homemade ice cream! Summer is so much fun! It’s starting to cool down in Charlotte and I’ve been feeling mighty nostalgic. Do you ever revert to your childhood at the approach of fall? I can’t help but think of the excitement of a new school year, shopping with my mom for fall clothes and school supplies, and the never-ending debate of “what should I be for Halloween?” What comes to your mind when you think of fall? I think of pumpkin of course, pulling out my favorite cozy sweater, campfires (wine! ), and curling up on the couch. Fall doesn’t sound so bad after all. 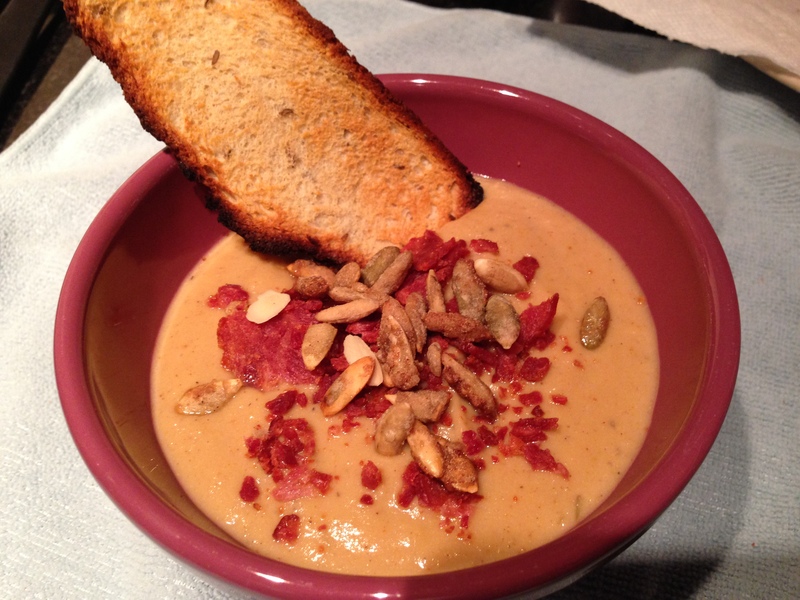 When the temperature drops, one of the things I look forward to most is ….SOUP! Soup is the equivalent of curling up in a soft blanket watching your favorite movie. Or maybe the most recent episode of The Chew! I went home with two heads of cauliflower after a trip to the grocery store on Sunday. I knew I wanted to make soup with one of them. Vegetable soups are perfect for weeknight meals as they are healthy and generally pretty quick to assemble. I loosely followed this recipe and think you will enjoy it! My husband who doesn’t particularly care for cauliflower had NO idea this was cauliflower soup. It’s incredible. This is what it looked like outside while I was cooking! Too good not to share. 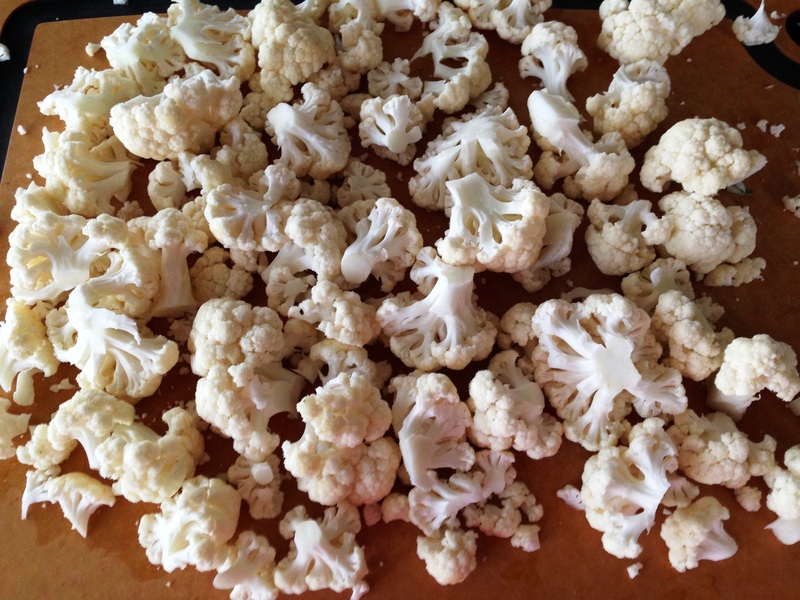 Cut up cauliflower into equal sized florets. drizzle with olive oil, salt, pepper and 1 tsp curry powder. Roast at 400 degrees for about 30 minutes. Simultaneously, roast a head of garlic. You can find the method here. 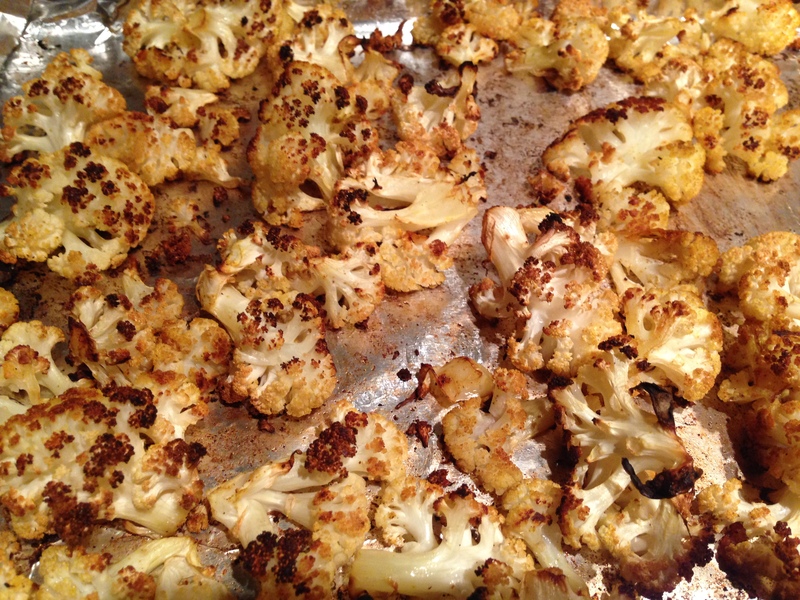 It will take a little longer to roast than the cauliflower, maybe 45 minutes to an hour. I like to roast mine until it’s crispy. You could stop right here and just eat your cauliflower like this. It’s delicious! Add butter to a large stock pot. 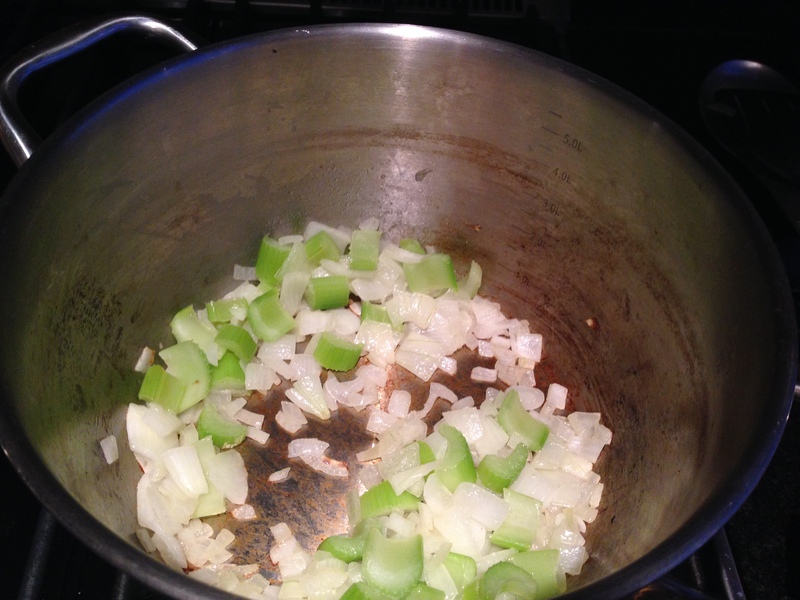 Add chopped onion and celery and cook for about 10 minutes until tender. Whisk in the salt, pepper, paprika, thyme, and flour and continue to cook for 2 more minutes. Add the wine and water, whisking to combine with the flour mixture. Then, slowly add in the 2 cups broth and roasted garlic cloves. 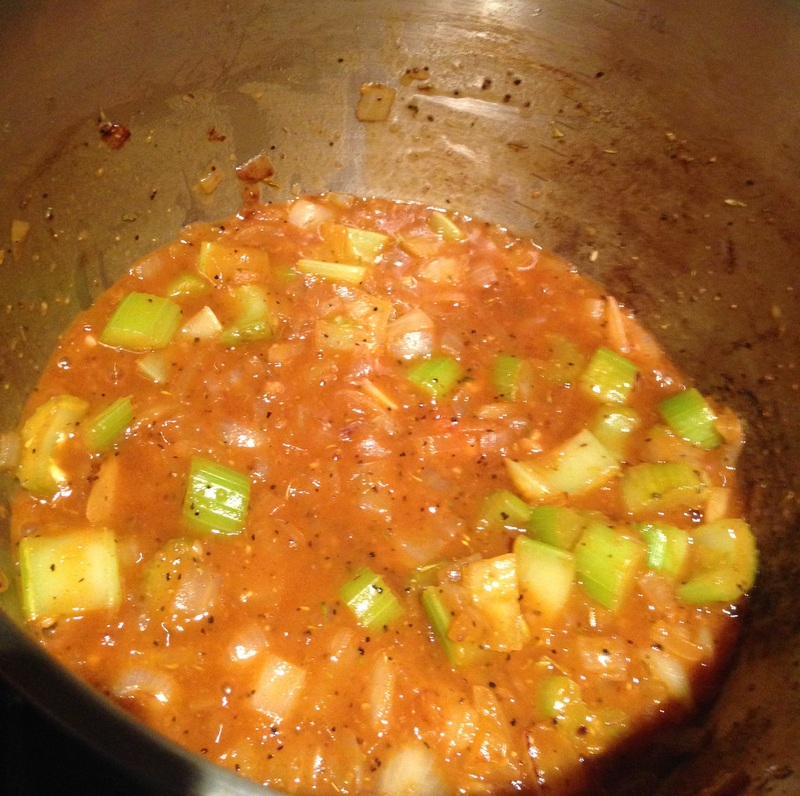 Bring mixture to a boil, then reduce heat to medium-low and simmer for 10 minutes. 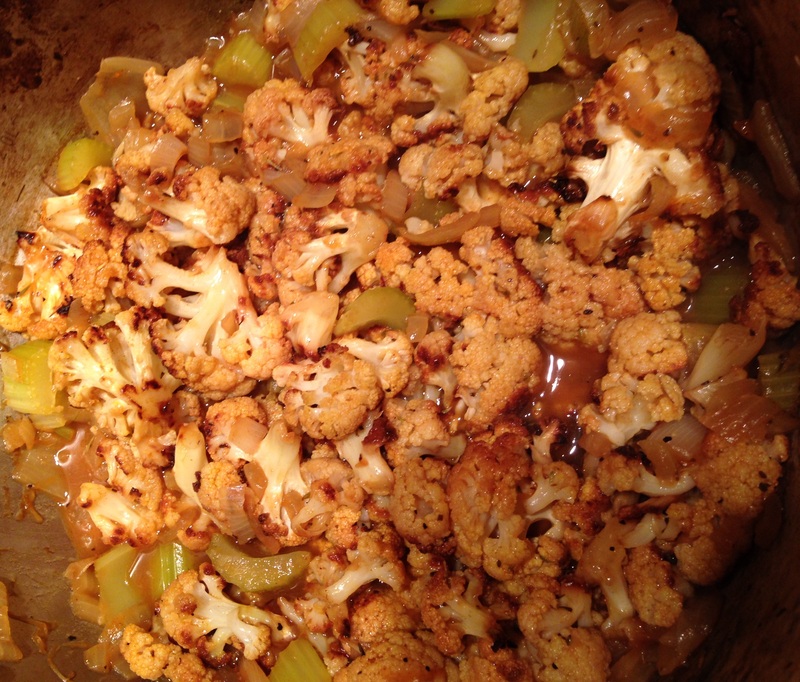 Add the cauliflower and simmer an additional 5 minutes. The cauliflower will absorb a lot of the liquid. When it looks like this, you are ready to puree!! I use a Vitamix, but an immersion blender would be great for this. Keep adding as much chicken broth as you need to get the consistency that you want. I like a thicker soup, so I probably added 1 1/2 cups. Once the soup is completely smooth, return the soup to your stock pot and stir in milk. The milk adds an extra level of creaminess and cools down the kick from the curry a bit. 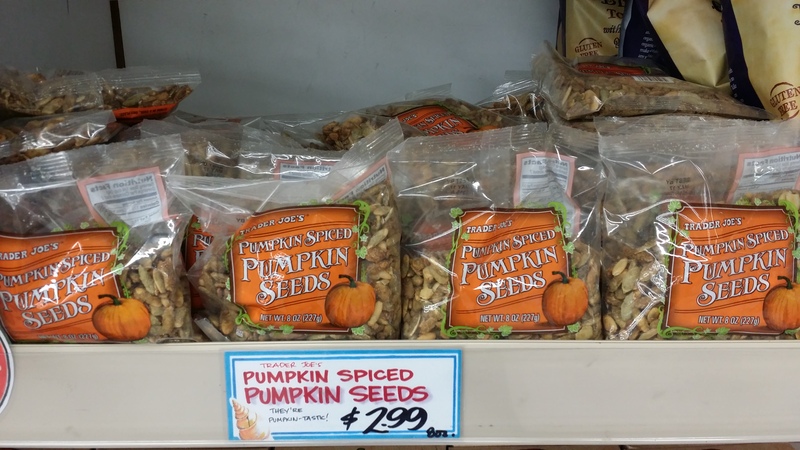 Sprinkle with crumbled turkey bacon and Trader’s Joe’s pumpkin spiced pumpkin seeds! I served mine with a piece of toasted Rye bread for dipping. I am on a Rye bread kick lately which is totally random! Previous: Previous post: Competition Dining: Fire in the City! You nailed the nostalgia factor of Fall ! As a child I loved the sound of the wind rustling among the falling leaves and that mystical sense you get at sunset as the days shorten and the nights increase. Yesterday, was the Autumnal equinox and your soup would be a perfect prelude to an ancient celebration of the harvest !!! I love how neither of you “girly girls” mentioned what fall makes me think of….FOOTBALL! I love fall because it means cooler weather, which is thrilling to me as I hate the heat. I’ve never made a cauliflower soup and my husband doesn’t’ typically eat it so I’ll give it a try this week and won’t tell him what it is. I’ll have to get back to you on the outcome! 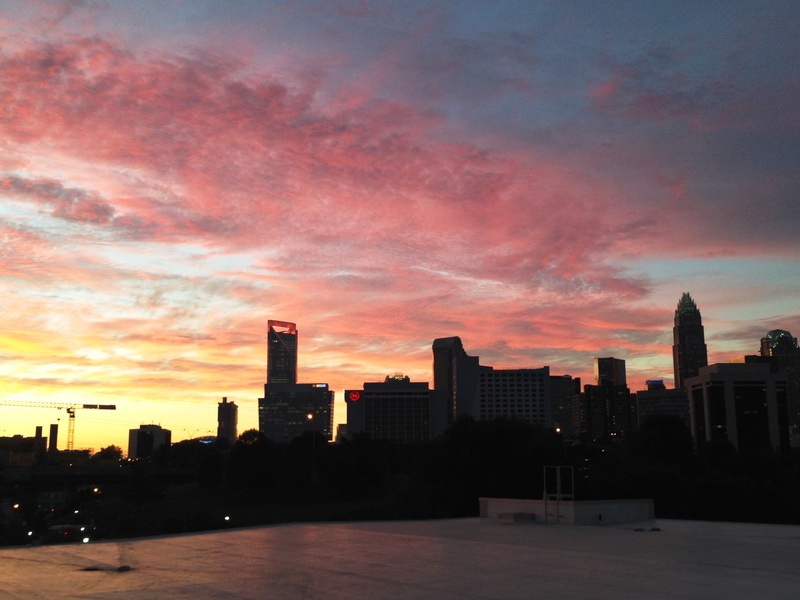 This looks delicious – and your sunset picture is beautiful!